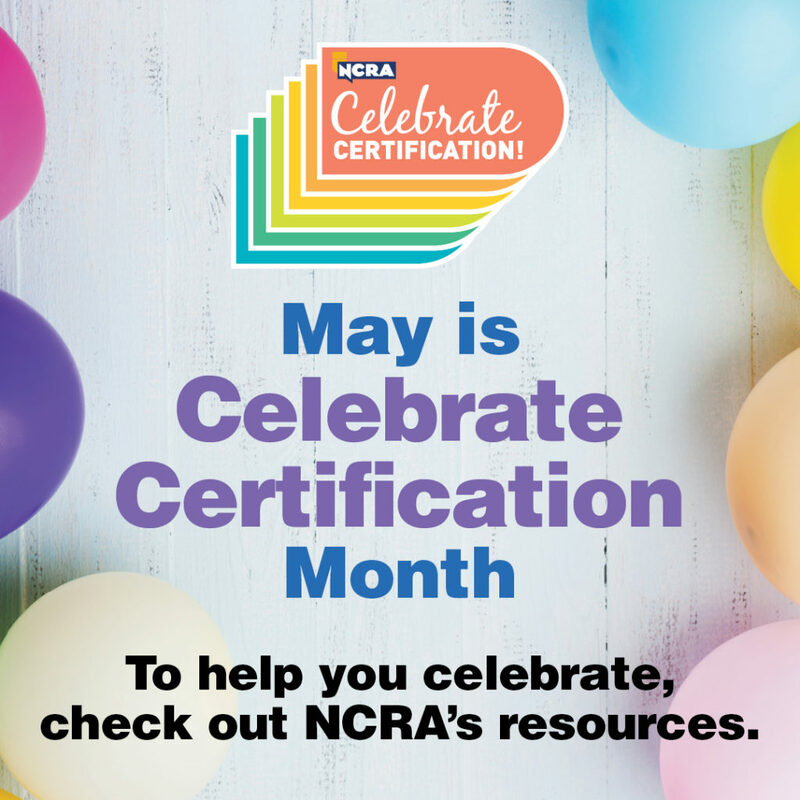 Take part in NCRA’s second Celebrate Certification Month this May and share with customers, clients, and potential clients the importance of working with professionals who hold national certifications. In any field, professional certifications are clear indicators that the people who hold them are committed to their chosen paths and believe that taking the extra time to earn them is worth it. Many professional organizations, from accountants to doctors, offer certifications. Certification gives people seeking specific services a way to recognize that someone meets the standard level of skills for a particular job. “Professional certification reflects our commitment to our profession and to keeping our skills polished to ensure that we provide the highest quality of service and product to our clients. NCRA is proud to recognize May as Celebrate Certification Month,” said NCRA President Sue A. Terry, FAPR, RPR, CRR, CRC, a freelance court reporter from Springfield, Ohio. 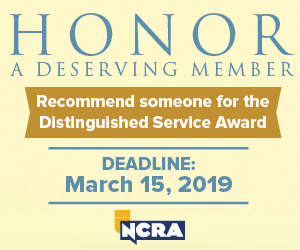 During Celebrate Certification Month, NCRA members and nonmembers are also encouraged to earn a certification or to add to any they already hold. In addition to showing proficiency in various skills, numerous NCRA membership surveys have found that court reporters, captioners, and legal videographers who hold NCRA certifications make more money and are often in higher demand than their competitors. “Earning a professional certification is one of the greatest investments we can make in ourselves as we strive to be the very best we can be every day. 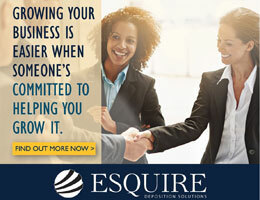 I urge everyone to take the time throughout the month of May to celebrate their professional certifications and those of their peers, and to take this opportunity to encourage others who do not hold professional certifications to make the investment in their careers to obtain them,” Terry added. 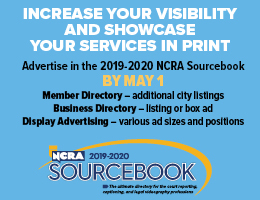 To help members celebrate throughout May, NCRA has made available a special resource page full of an array of materials such as a press release, social media posts, email signatures, new CART and certification fliers, and brand-new certification business cards and career business cards. For more information about the 2019 Celebrate Certification Month, contact pr@ncra.org. Share with NCRA how you celebrate the month by sending information to pr@ncra.org. The Illinois Patch.com reported on April 9 that the South Suburban College (SSC) is hosting a Court Reporting Open House on May 9 to showcase this unique profession and wide-open job market. Hurry! 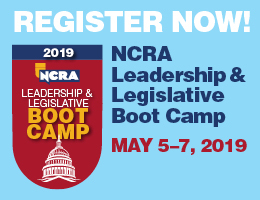 Registration closes April 5 for NCRA’s 2019 Leadership & Legislative Boot Camp taking place May 5-7 outside of Washington, D.C. This event promises attendees the ultimate in training to help them become highly effective leaders and advocates for the court reporting and captioning professions. The cost to participate in the 2019 Leadership & Legislative Boot Camp is $225 per NCRA member and $175 for a second member attending from the same state. The nonmember rate is $325. Registration ends on April 5. Attendees are encouraged to book a room at a special rate of $239 per night at the host hotel Embassy Suites in Old Town Alexandria, Va. The special rate includes a cooked-to-order breakfast along with a nightly reception with appetizers and drinks. Remember, staying in the host hotel helps keep the registration costs of NCRA events low, so book now. The deadline to book in the room block at the special event rate is April 11. To take advantage of this special rate, see the link at the end of this article. A major component of successful advocacy is building good relationships through communication with lawmakers. NCRA’s Leadership & Legislative Boot Camp devotes a significant portion of the program’s focus to helping attendees learn the ins and outs of doing just that by providing the groundwork to design strategies and offering the opportunity to test those strategies through role-playing. Attendees will be broken into groups, given roles, and provided with a scenario so they can practice their lobbying skills. They will also have the opportunity to participate in mock hearings and earn prizes for the best presentation. Other highlights on the 2019 schedule include a session about the do’s and don’ts of lobbying that will be led by Mike Goodman, vice president of Cornerstone Government Affairs in Washington, D.C. Goodman, former chief of staff for Rep. Ron Kind (Wisconsin), will teach attendees how to speak to legislative staffers and their bosses and what to do and not to do when advocating for the profession. Additional sessions will focus on the nuts and bolts of association work; politics 101; understanding NCRA’s 2019 federal initiative; the state of the court reporting, captioning, and legal videography professions; how to mobilize a membership; successfully use grassroots advocacy; and more. 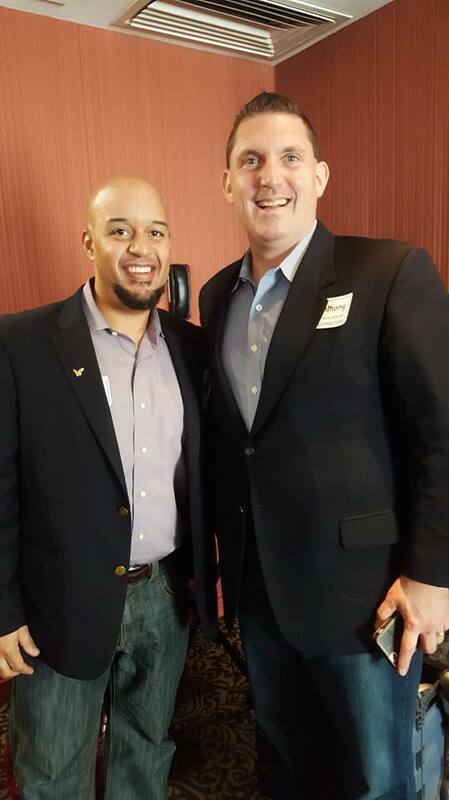 Click here to read more about what the 2019 Leadership and Legislative Boot Camp has to offer as well as more about the presenters. Remember: Registration closes on April 5, so don’t wait! Secure your spot now. To take advantage of the special host hotel rate, click here or call 1-800-EMBASSY and reference group code: MLV. HLAA to celebrate 40th anniversary at 2019 convention in Rochester, N.Y. The Hearing Loss Association of America (HLAA), Bethesda, Md., announced in a press release that it will mark its 40th anniversary during its 2019 Convention being held June 20-23 in Rochester, N.Y., which will feature keynote speaker Rebecca Alexander, a psychotherapist, disability rights advocate, group fitness instructor, extreme athlete, and author, who has hearing and vision loss. Registration closes April 5 for NCRA’s 2019 Leadership & Legislative Boot Camp taking place May 5-7 outside of Washington, D.C. State leaders, don’t miss this opportunity to hone your leadership and lobbying skills at NCRA’s premier advocacy educational event designed to teach you how to be an effective leader for the court reporting and captioning professions and experience what it is like to advocate on Capitol Hill. If you are a state leader or are aspiring to become one, this event is for you. The cost to participate in the 2019 Leadership & Legislative Boot Camp is $225 per NCRA member and $175 for a second member attending from the state. The nonmember rate is $325. Registration ends on April 5. Once an attendee registers, they will receive a confirmation email with a link to book a hotel room at a special rate of $239 per night at the Embassy Suites in Old Town Alexandria, Va. The special rate includes a cooked-to-order breakfast along with a nightly reception with appetizers and drinks. Remember, staying in the host hotel helps keep the registration costs of NCRA events low, so book now. The deadline to book in the room block is April 12. Brewer and other attendees will learn more about the do’s and don’ts of lobbying in a session that will be led by Mike Goodman, vice president of Cornerstone Government Affairs in Washington, D.C. Goodman, former chief of staff for Rep. Ron Kind (Wisconsin), will teach attendees how to speak to legislative staffers and their bosses and what to do and not to do when advocating for the profession. Other sessions will focus on the nuts and bolts of association work, politics 101, understanding NCRA’s 2019 federal initiative, the state of the court reporting, captioning, and legal videography professions, and how to mobilize a membership and successfully use grassroots advocacy, role playing, strategizing, and more. 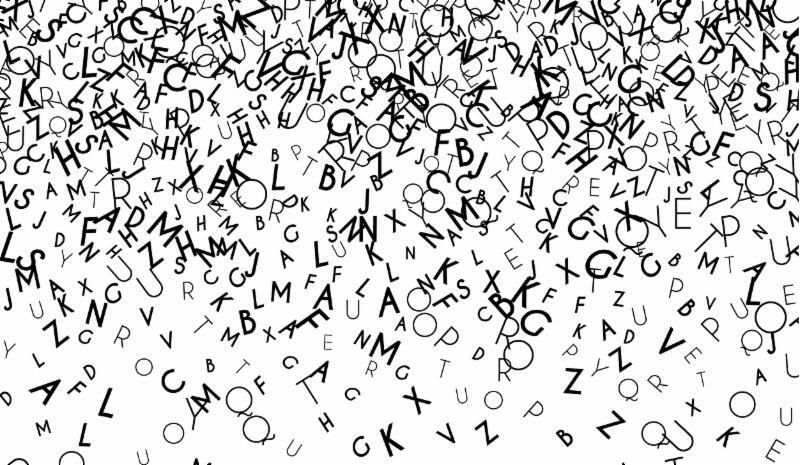 “The legislative and regulatory landscape is always changing at the state and federal levels,” said Debra A. Dibble, RDR, CRR, CRC, a freelance court reporter from Woodland, Utah, and NCRA’s Secretary-Treasurer. This year’s Boot Camp will mark the sixth one Dibble has attended. “NCRA’s Leadership and Legislative Boot Camp arms you with the tools and techniques you need to keep balanced on that changing landscape and be better able to educate lawmakers and regulators, so they can make the right decisions when addressing issues that relate to the court reporting and captioning professions,” she added. If you are a state leader or are aspiring to become one, don’t miss NCRA’s 2019 Leadership & Legislative Boot Camp happening May 5-7, outside of Washington, D.C. Registration is now open, and spots are filling fast. This event is NCRA’s premier advocacy educational event designed to teach state leaders how to be effective for the court reporting and captioning professions and experience what it is like to advocate on Capitol Hill. “This is absolutely the best investment state associations can make in their leadership teams,” said Phyllis Craver Lykken, RPR, a freelance court reporter from Yakima, Wash., who has attended NCRA’s Boot Camp before. She noted that the Washington Court Reporters Association (WCRA) is planning to send at least one of its future leaders to “muscle up” at this year’s event. 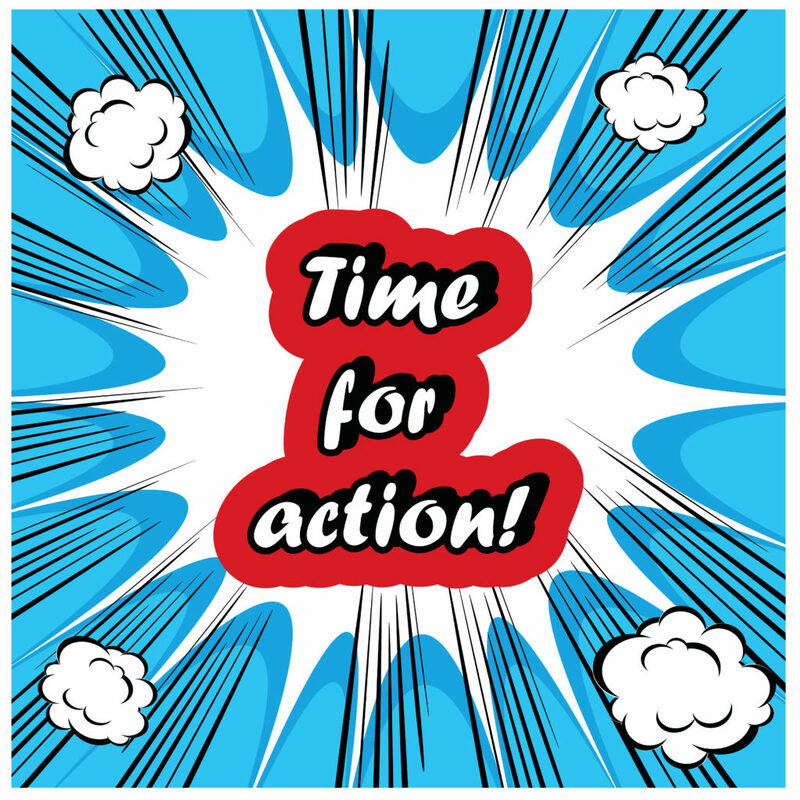 The cost to participate in the 2019 Leadership & Legislative Boot Camp is $225 per NCRA member and $175 for a second member attending from the state. The nonmember rate is $325. Registration ends on April 5. Once an attendee registers, they will receive a confirmation email with a link to book a hotel room at a special rate of $239 per night at the Embassy Suites in Old Town Alexandria, Va. The deadline to book a room at the special rate ends on April 12. Craver Lykken said that, while serving as WCRA president, a bill was introduced in the state legislature to eliminate the state’s mandatory Court Reporting Practice Act. The 2019 Leadership & Legislative Boot Camp will kick off with a session that will cover what attendees need to know about participating in the event. Other sessions will focus on the nuts and bolts of association work, politics 101, understanding NCRA’s 2019 federal initiative, more about the state of the court reporting, captioning, and legal videography professions, and how to mobilize a membership and successfully use grassroots advocacy — and that’s just the first day! “Boot Camp is a truly immersive experience. If there’s one thing you need to know in advance, it’s don’t plan on bringing any work with you or doing any sightseeing during the event. You’ll be busy every single minute,” said Liz Harvey, RPR, CCR, a freelance court reporter from Seattle, Wash., who has attended before. “The fact that Boot Camp is held in our nation’s capital makes it especially inspiring. To be able to take the training we received and immediately put it into action on Capitol Hill is truly rewarding. It’s an experience you won’t duplicate anywhere else,” Harvey added. Remember, registration closes on April 5 so don’t wait! Secure your spot now. Fox 21 reported on March 5 that Chimniak Court Reporting, Chicago, Ill., recently participated in the DuPage Association of Women Lawyers Project Law Day. Have you ever noticed that court reporting is a field dominated by the lovely ladies? No? Oh, I have. When I first started this journey in September of 1990, I was one of six males in two theory classes with a combined 106 students. As you can imagine, as a young man, this was a beautiful thing. It is something that I got used to very quickly. I know back in the 1950s and 1960s, court reporting was a male-dominated field. Not so today. This year as 2019 Court Reporting & Captioning Week approached, I had a thought: Wouldn’t it be great to highlight the Men of Court Reporting on Facebook? I started the week with a post indicating that I was going to be highlighting some of the Men of Court Reporting. I started by posting pictures of my male court reporting friends who I’ve met at the conventions every summer the past several years. Then the idea sort of took off, and I started to highlight and post a picture of every male court reporter that I knew. Some comments from a couple of female court reporters suggested that highlighting the men of this great field was something that was long overdue. 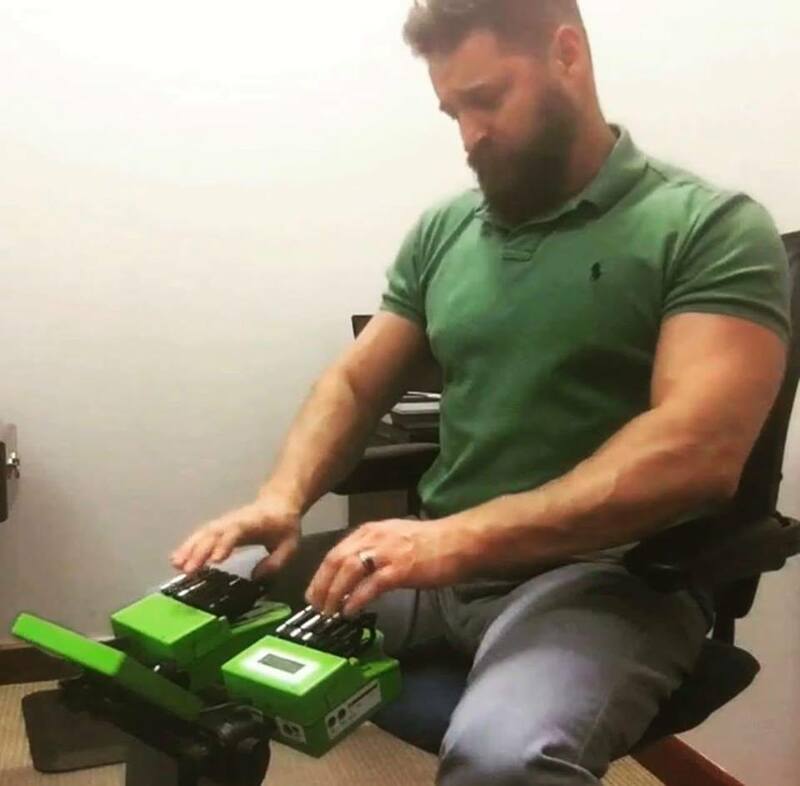 It started to become a group effort as some male court reporters such as Lance Boardman, RDR, CRR; Michael Bouley, RDR; Reid Goldsmith, CRI; Mike Miller, FAPR, RDR, CRR; and others started sending me suggestions to post this gentleman, or we need to post this gentleman as well. If you go to my personal Facebook page, the “Men of Court Reporting” posts are all there with a public setting, so that anyone can view them all, and I also used the hashtag #CRCW2019. I thought it really made the week very special for all the hardworking men who are in this female-dominated field. There were a lot of men who I didn’t post since I don’t know everyone, but I gave it my best shot. Thank you, men of court reporting! Also in the back of my mind, I was thinking that other young men might perhaps see how many men there are in court reporting and would think of going into this industry. 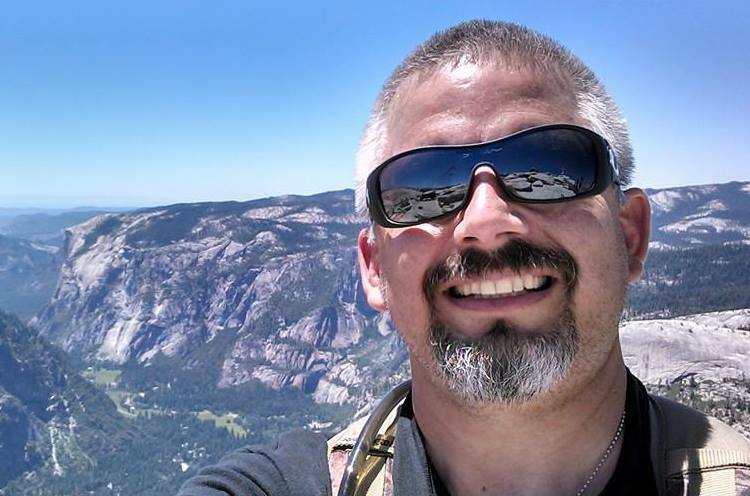 Rich Germosen, RMR, CRR, is a freelance court reporter from North Brunswick, N.J.